It’s all relative in the Secret Laboratory. And until I finish the Annihilator Ray you can call me what you like – but I still prefer “Demented Iconoclast” or “Grumpy Visionary”. Now, just sit still and let’s get started, shall we? “Demented Iconoclast”, “Bent Inventor”, and “Lab Loon” are also good, of course. 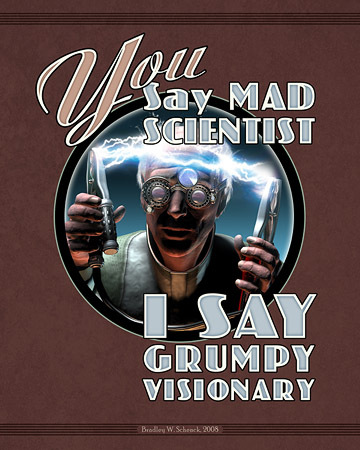 But if you must persist with the Mad Scientist thing, make it DOCTOR Mad Scientist, would you? This began its life as a T-Shirt design for the Retropolis Transit Authority. Then it achieved sentience, climbed out of the tank, and ate a lab assistant. All in all, quite a successful experiment! While the plum job on an airship is – of course – the Captaincy, with that cool hat and the riding crop, there are any number of other important and prestigious positions on the airships of Retropolis. Cooks, for example. The crews who swarm over the gas bags and make speedy repairs. The stewards who serve travellers and empty the ashtrays in the pigskin-lined smoking compartments. Cabin boys. You get it. And then, of course, the incredibly important and yet underappreciated job we celebrate here today. 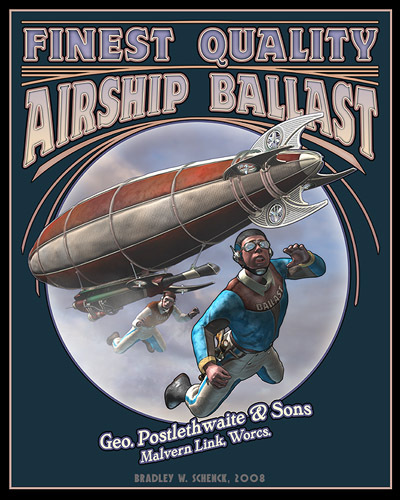 Because at some point, just about any airship needs to gain altitude in a big hurry. And there are only so many ways to do that. So here, salute the unsung heroes of the skyways: Ballastmen. Provided at reasonable rates by Geo. Postlethwaite and Sons. No returns; sorry! 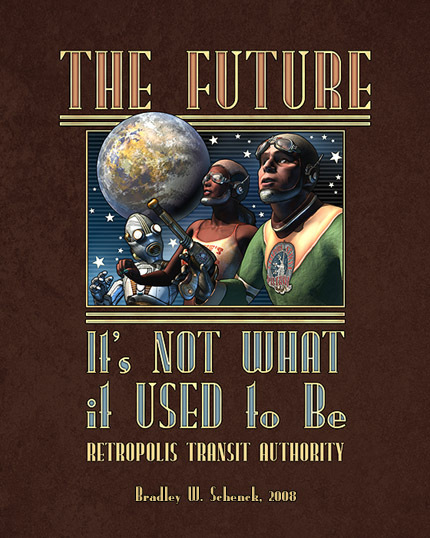 This is once again a T-Shirt design for my Retropolis Transit Authority site. Providing uniforms for Ballastmen since, oh, about twenty minutes ago. Warren Ellis has posted Gianluca Pagliarini’s pencil art for the cover to issue #1 of Ignition City, due out next spring. Ignition City‘s a comics project I’ve been looking forward to since its original announcement – it’s described as a sort of unholy union of Flash Gordon and Deadwood, with disillusioned retrofuturist heroes drowning their sorrows, kicking cans, and swearing up a storm in a retro future that isn’t quite as pleasant as we might like. Sounds like loads of fun to me. There’s also an ongoing thread at Ellis’ Whitechapel forum with concept art, designs, and yet another cover preview. Let the countdown begin! It’s true enough: we were so good at imagining the future, once upon a time, that even though we’ve ended up with some pretty great things our present just can’t compare with the future we thought we were getting. Would you REALLY rather have an Ipod than a jet pack? But on the other hand, we’ve gradually been freeing ourselves from some of that social baggage whose weight keeps us dragging our heels through the turnstiles of the future. So since we can nearly see our way ahead to the days when the metallic content – or the color – of our outer selves won’t make a pig’s whisker of a difference to anyone, maybe we’re getting a better bargain than it seems we are, when we dwell on that whole flying car thing. And that’s the dichotomy I like about this picture. On its own shiny and colorful outer self it’s about one thing, but it could just as easily be about another. And whichever way you choose to see it, it’s always “Not what it used to be”. This is yet another T-shirt design for my Retropolis Transit Authority site, among other things. Like a coffee mug, poster, greeting cards, and blank books.